It's probably fair to say that Del Valle wouldn't immediately pop into mind when thinking of places to go mountain biking in the East Bay, at least unless you happen to live nearby. From most parts of the Bay Area, the driving time to reach this park is substantial and most trails in the park are typical East Bay fire roads: mostly featureless and frequently very steep. That is the reason I had put off trying out a ride here until I read that some of the trails in the park are actually bike-legal singletrack. I must say that my impression has changed significantly after riding here. I can't say that I would now list it among the prime ride destinations in the Bay Area, but it certainly ranks, surprisingly, among the top three East Bay destinations in terms of the amount of bike-legal singletrack. It also doesn't hurt that the park is wrapped around a sizable reservoir snaking through a valley that's several miles long, and, consequently, lake views are almost always available during your ride. Del Valle Regional Park provides for numerous outdoor activities, including boating, fishing, picnicking, and swimming. The southeastern end of the park is where most of these activities are clustered. Most of the trails at Del Valle (especially when speaking of bike-legal trails) are also clustered in the southeastern half of the park. While there is a selection of fire roads meandering atop the hills directly north of the main parking lots there, virtually all the trails that are likely to interest bikers, including all the singletrack trails (at least those of which I'm currently aware), are situated on a strip of lake shore leading northwest along East Shore Trail. That is the area traversed by this particular ride and pretty much all the trails in this park that bikers would enjoy are included in the route shown on this page. The ride follows essentially an out-and-back route along the eastern shore of the reservoir lake. There's only a small looping section right at the turn-around point, but that was only to bypass a return over some twisty (and longer) singletrack, because my riding buddies and I were starting to feel that we might be running out of time and wanted to save a few minutes on this particular ride. 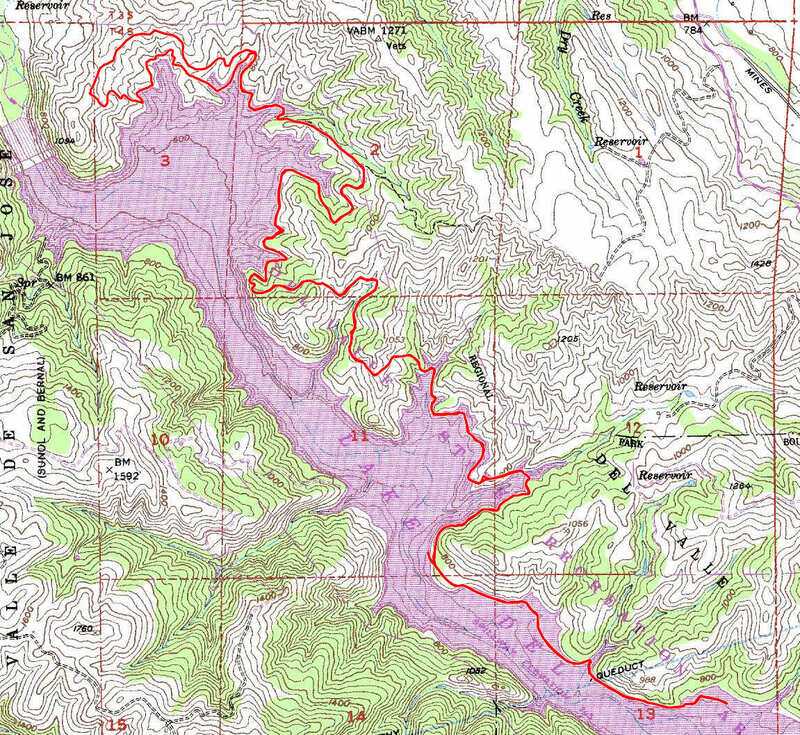 In its current form, about 45% of this ride is on singletrack, with the rest on fire roads. That ratio would even rise to slightly above 50% if you do the ride as a pure out-and-back (which is recommended) instead of taking the fire road back from the turn-around point resulting in that small loop shown on this page. This is a phenomenal singletrack ratio for a 14-mile East Bay ride. We're not really talking about singletrack trails like what you'll find at Demo Forest perhaps, but given the rarity of any kind of legal singletrack in the East Bay, it's still excellent. Virtually all of the singletrack trail segments on this ride are in the form of short bypasses on the lake side of East Shore Trail. This gives the ride the appearance of a series of short singletrack jaunts strung together by interconnecting segments of fire road riding. The ride takes place within a narrow band of elevation between 700 and 1000 feet. However, the many ups and downs on the elevation profile do add up to a respectable amount of total climb, as you can see. So, thinking of this ride as "an easy ride along a lake shore" would be a mistake. The stretches of fire road along the route have as many steep climbs as any typical East Bay fire road. Grades easily exceed 15% and, in a couple of cases, even 20%. Tree cover throughout this ride route ranges from little to none. With the possible exception of a brief segment along the first stretch of Swallow Bay Trail, what tree cover you'll be getting is no more than a loose sprinkling of oak trees. With that in mind, and considering the inland location of this park, it's worth remembering the fact that it can get oppressively hot here during the warmer months of the year, making it important to plan the amount of water you'll carry (bring more than you think you'll need) and the time of the day for your ride (the earlier in the morning, the better) accordingly, if you plan to ride here during that season. Meanwhile, the grass-covered hills that fill your views during the ride are likely to be blanketed in bright green during the green-grass months of the year (typically, January to April). The photos linked on your left are from a ride in February, but during a year that was unusually dry. So, don't let those mislead you. After your ride, Livermore is an obvious option if you have time for some food or drinks. I haven't spent enough time in Livermore to produce suggestions as informed as a local, but the place where I had lunch in downtown Livermore after this particular ride is one choice I can easily recommend: First Street Alehouse. It's a big place, yet popular enough to still make it difficult to get a table on a weekend. The menu seems focused mainly on comfort food and pub fare, with burgers (which looked good) apparently their specialty. While I'm not a big beer drinker, if the frequency with which the Pliny the Elder beer is mentioned on MTBR is any indication, then it's probably a detail worth mentioning for some mountain bikers that this particular pub is one of a limited number of places where this fine brew is served.